We have more new fabrics from Robert Kaufman's London Calling line. In bright, cheerful florals, these lightweight cotton lawns will sew up perfectly into blouses, skirts, dresses, and accessories. Easy to sew, easy to wear: what's not to love? We have some new rayon challis print from Cotton + Steel, from their Frock line. As the name suggests, these fabric are perfect for dresses! There's really nothing so wonderful to wear as a soft drapey fabric like rayon. It feels great on the skin and it's easy to wash and wear. Hankering for spring dresses? There are loads of dress fabrics to choose from in our store! Come take a look! We have a gorgeous new collection of cotton prints by Flora Bowley for Red Rooster. Featuring birds and plant life, illustrated in rich, painterly forms, this is a collection you shouldn't miss. 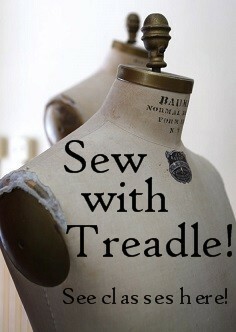 Also available at Treadle: this free quilt pattern using these fabrics! We have some great new fabrics from Art Gallery! A beautiful selection of cotton prints plus some great printed knits! More fun new fabrics to share! We have some modern, casual new lace fabrics just perfect for layering garments that waft on a spring breeze. And check out these floaty burnout-look fabrics, sheer and textured in a crisp cotton blend. We have some great new fabrics made for home decorating. These touch cotton canvas fabrics have fun, large-scale prints sure to freshen up your decor. Try them in pillows, wall hangings, and upholstery projects. They would also make great purses and bags! Finally, we have a group of tough and durable outdoor fabrics, specially treated to withstand wear, moisture, and sunlight. Perfect for your patio cushions! Mary and Michele have returned from a fabric buying trip in Las Vegas, and the new fabrics they ordered are starting to arrive! Check out a few highlights from the newest selection of goodies. So many springy delights! Including soft, diaphanous cotton lawn and silk/cotton voile. . . Crisp cotton poplin, seersucker, and shirting. . .
And soft, drapey rayons and knits! There are plenty more new fabrics in the store - and on the way! Our annual Anniversary Sale continues! Enjoy 20% off ALL fabrics in the store, with selected groups 30%-50% off, through Sunday April 12th. Ready for spring breezes? Try this great knit top! Flatteringly simple in front, the back has a surprise detail. You'll look good coming and gong with this crossover wrap back! This top was made from McCall's 7127 in a cotton knit with a fun dot print. Our Spring Anniversary Sale continues! Stop by today for some great discounts! Our annual Anniversary Sale starts tomorrow, Thursday, April 2nd! Enjoy 20% off ALL fabrics in the store, with selected groups 30%-50% off! Great discounts on silk, wool, linen, oilcloth, Liberty of London, designer cotton prints, and so much more. Stop by on Friday, April 3rd from 4 to 6 pm for delicious mini cupcakes from Cupcake. Please join us to celebrate 39 years of fine fabrics and wonderful friendships.